We design and manufacture autonomous instruments that measure the marine and freshwater inorganic carbon parameters pCO2 (partial pressure of carbon dioxide) and pH using our patented drift-free technology. 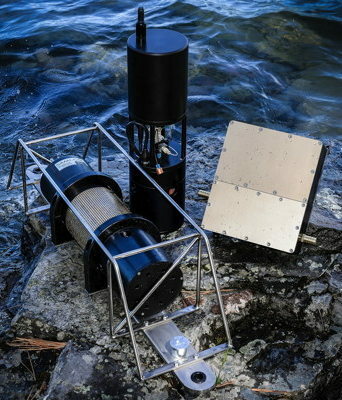 The SAMI ™ – Submersible Autonomous Moored Instrument – measures and logs pH or pCO2 in marine and freshwater environments over long periods with ultra-low power and reagent consumption, providing valuable time-series data to researchers around the world. The AFT - Autonomous Flow Through - uses the same technology for flow through measurements on research vessels or on the bench-top. Our SuperCO2 systems are designed for high frequency pCO2 measurements from a sample stream using either a showerhead equilibrator or contactor. Sunburst Sensors is proud to have recently won both purses of the Wendy Schmidt Ocean Health XPRIZE using instruments based on our SAMI technology. Read about it in Sunburst News. We are now selling the 'iSAMI-pH' system based on the technology that won the 'affordability purse'. Read more about it here.